The popular bralettes that first made a debut on the scene of mainstream music festivals have slowly integrated their way into yoga apparel. Yogis shouldn’t be surprised at this quick crossover. After all, the stretchy bralettes are comfortable, particularly as you move, bend, and stretch. If you’ve been considering replacing your trusty sports bra with something hipper and more comfortable, a bralette is the way to go. Here are three handy tips for helping you figure out which one is absolutely perfect for your body. 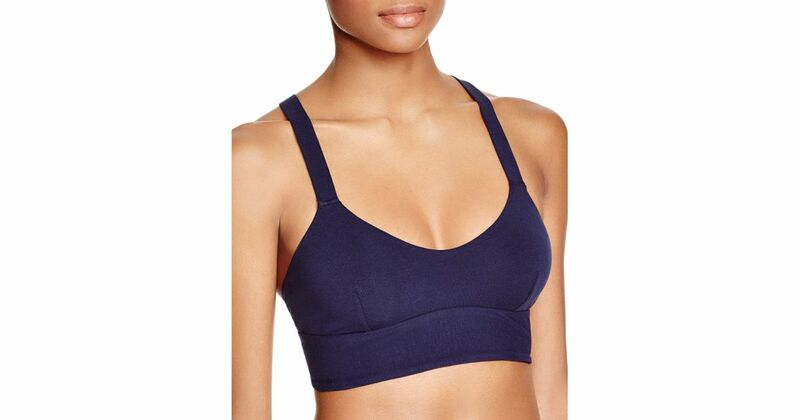 Many sports bras adhere to the traditional sizing system for regular bras, using a band size and cup letter. Bralettes are a little different, which means you should plan to try some on in store prior to making a purchase. These new additions to the bra category are typically very stretchy, being made of cotton or microfiber for the most part. Decorative bralettes can be found in lace. As a result of their stretchy nature, they’re sized more like a good pair of yoga pants. Most companies will size them in groups ranging from extra-small to extra-large. If you’re going to wear your bralette as a top to your next yoga class, you should really look for options that have lightly lined cups. Many are completely unlined, which can be great and more comfortable when wearing them underneath another shirt. However, an unlined bralette in the middle of a crowded yoga class can lead to some uncomfortable moments for you and your classmates. As you move through rigorous practice, your body naturally builds an incredible amount of heat. Wearing a bralette is a great way to stay cool during a practice like this. Your body slowly starts to cool down by the end of class, which could mean an embarrassing faux pas in an unlined bra. Keep yourself covered and protected with some light liners. If you’re a large-busted yogi, a bralette may not be the right fit for your yoga practice. Unlike many sports bras that feature thick fabrics and possibly even underwire, bralettes offer very little support in the larger sizes. This could lead to pain and discomfort if you’re accustomed to an extremely rigorous yoga practice. Not to mention, you may not relish the idea of having your chest bouncing around during your practice. Yogis who have larger chests may want to search for a bralette with an underwire or one that allows you to wear a more supportive bra underneath. This can allow you to capitalize on the trend without sacrificing your comfort. A bralette could be the perfect addition to your trusted pair of black yoga pants. You can opt for a lace version to dress them up or a sportier version to match your workout vibe. Whichever style you choose, you’re bound to be comfortable and cool during a heated yoga practice. ← Yoga and Music: What Is the Connection?